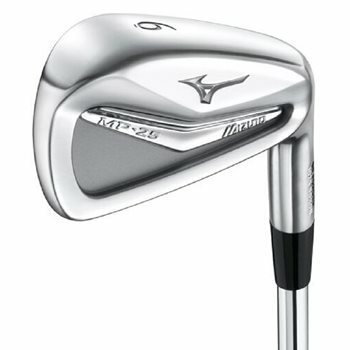 The Mizuno MP-25 iron set is the perfect combination of getting added distance without sacrificing the feel and ball control Mizuno irons are known for. They feature a tour inspired design and are made from Grain Flow Forged 1025 Boron. To get the most out of the 1025 Boron material, the MP-25 were designed with Micro Slot Technology, a milling in the head from the sole up to allow for more face flex for increased distance and forgiveness. With standard lofts, this iron set maintains the proper gaps between clubs for ideal distance control. Is it possible to see a picture of these irons, face, back, grip and shaft?. I had looked at these when you had a 40% off special. Could I still get that offer? Unfortunately, due to the size of our inventory and multiple shipping locations, we are unable to provide actual pictures of a specific set.